Last year, Kollective CEO Dan Vetras offered to fly his thirty-five Bay Area employees to Bend on a weekend relocation scouting mission. As the head of a fast-growing cloud-based video software startup, Vetras wanted to find a place with affordable office space and a high quality of life for his employees. Bend provided both. First, however, Vetras needed to know whether a critical mass of his staff would be willing to move. After visiting, a dozen employees indicated they’d relocate. 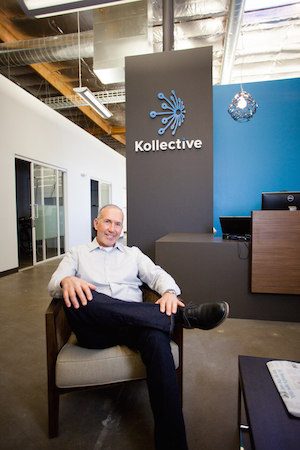 Kollective opened its Bend office in the 1001 Tech Center this past summer and immediately started hiring. Vetras expects the office will have twenty-five employees by year’s end. “It’s proving the thesis that we can recruit for and build out a software company in Bend,” said Vetras. The company kept a smaller California office, but the move helped cut its real estate costs by 65 percent, freeing up capital that Kollective can use to grow. The CEO noted that the long-term success of Bend’s tech companies depends largely on OSU-Cascades creating a pipeline of computer engineers who come for school and stick around.